This study examines the spatial rainfall variability in peninsular India from a nonlinear dynamic perspective. The rainfall variability is determined by employing the false nearest neighbor (FNN) method, a nonlinear dynamic dimensionality-based method, to rainfall data across peninsular India. The implementation of the FNN method involves phase space reconstruction of the rainfall time series using a delay embedding procedure and identification of the false nearest neighbors in the reconstructed phase space using a neighbor search approach. The method is applied to monthly rainfall data over a period of 35 years (January 1971–December 2005) at each of 367 grids (of 0.5° × 0.5° in size) across nine river basins in peninsular India, and the dimensionality (i.e. FNN dimension) is determined. The influence of the delay time (τ) on the FNN dimension estimation is also investigated by considering four different cases of separation of data in phase space reconstruction: monthly (τ = 1) and annual (τ = 12) as well as delay time values from the autocorrelation function method and the average mutual information method. The results indicate that, considering all the four τ values, the dimensionality of the 367 rainfall time series ranges from as low as 3 to as high as 20. The FNN dimension is found to generally vary, sometimes significantly, both for the same τ value for different grids and for the different τ values for the same grid. A basin-wise analysis of the dimensionality results also indicates that the Tapi basin (in the northwest part) exhibits the highest spatial rainfall variability (dimension ranging from 3 to 20), while the Vamsadhara basin (in the northeast part) exhibits the lowest rainfall variability (dimension ranging from 4 to 8). In general, rainfall in the southern and eastern basins have relatively lower dimensionality, while rainfall in the northern and western basins have relatively higher dimensionality. While there is almost no variability in the minimum FNN dimension of rainfall between the nine basins studied, there is significant variability in the maximum FNN dimension of rainfall between the basins. 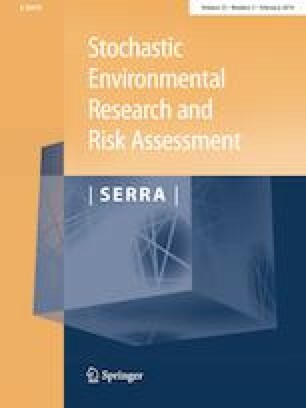 These results facilitate more reliable identification of rainfall spatial characteristics based on complexity and their classification and, thus, have important implications for the identification of the appropriate complexity of rainfall models for an area, rainfall interpolation/extrapolation, and basin water assessment and management.